Swiss citizens who are required to have weapons of military utility possess fully-automatic weapons that most Americans are not allowed to have. Guns provide power to civilians. We trust ourselves and we are thankful for our guns. I suspect there are causes for school shootings other than the existence of firearms… perhaps Psychotropic Medications? how many of the shooters were on drugs? no one seems to want to talk about that… esp big pharma… and what effects do psycho active drugs have on immature brains? something has changed in psychophysiology in recent years…. and no one seems to want to check the science… just blather about firearms… as tho inanimate objects… were casting evil spells on our young people…. Fourteen children died at Stoneman Douglas High School because teachers were unarmed and unable to defend their children. Yet having killed two students in Pearl, MS, deranged student Luke Woodham was disarmed by the Assistant Principal who retrieved his DEFENSIVE gun from his truck. But after every mass shooting, the Democrats continue to trot out the same tired gun control laws – laws which would have done nothing to stop the spree shooter. The proposed Stop School Shootings law will stop innumerable school shootings all across the country by discouraging mentally disturbed students from attacking the innocent. Discouragement will discourage many, so don’t let the fruitless desire for perfection become the enemy of the good. If you can see how this will help decrease the number of school shootings, how do we persuade Republican politicians to propose this after every school shooting? “Over the last fifty years, with only one single exception [politician Gabby Giffords], every single mass shooting event with more than four casualties has taken place in a place where guns were supposedly NOT allowed.” Larry Correia, Expert State Witness gun professional. 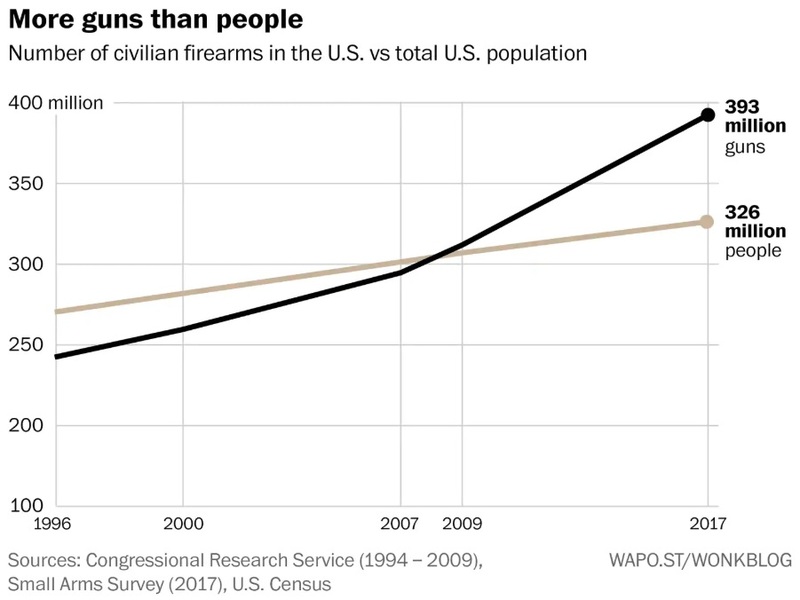 It’s a bit misleading to look a guns vs population. Only a third of US households own even one gun, so a lot of households own multiple guns. Some even own dozens – or more, like my dad’s friend who has an entire long room in his house with case after case of guns he collects. But he doesn’t shoot them. 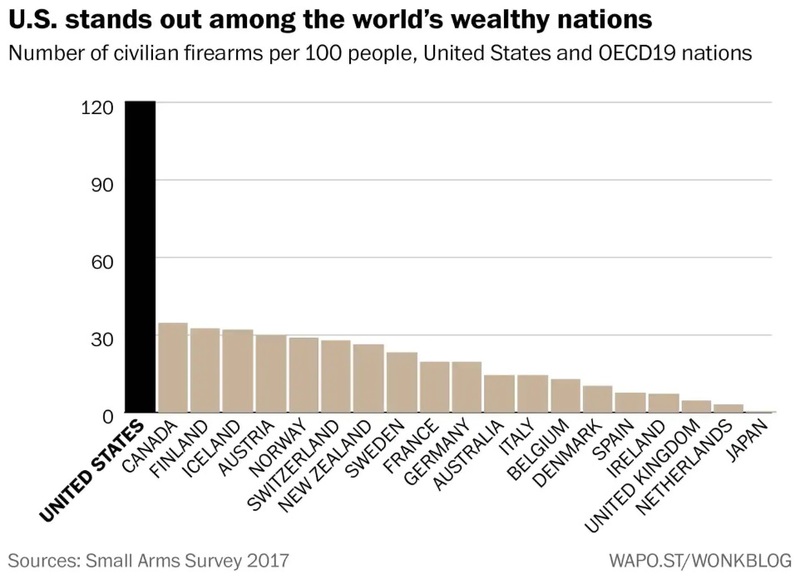 My understanding is that the Swiss have one military-issue weapon per family. In the US, an individual may have multiple types of weapon and may own a variety for different purposes. You can’t compare the two cultures.